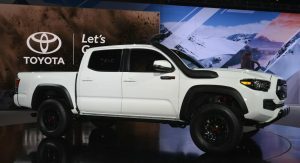 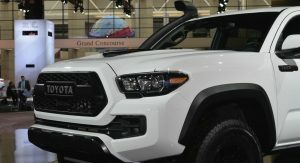 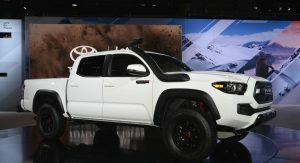 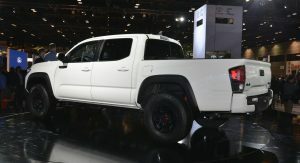 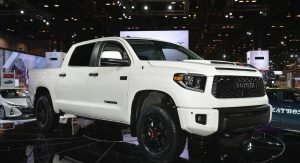 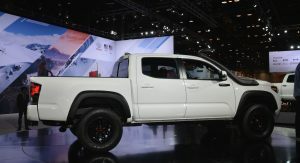 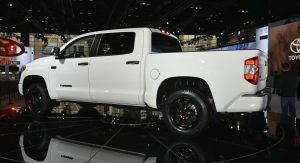 Toyota has premiered its 2019 range of TRD Pro models, which are based on the 4Runner, Tundra, and the Tacoma, at the Chicago Auto Show. 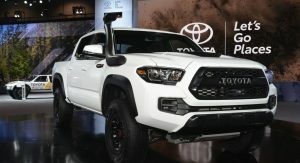 The biggest difference between the TRD Pro models and run-of-the-mill 4Runner, Tundra, and Tacoma variants are the upgraded suspension systems. 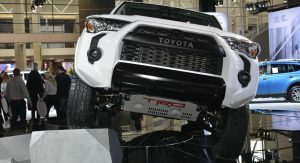 Each vehicle adopts custom suspension tuning but they all share the same 2.5-inch Fox Internal Bypass shocks. 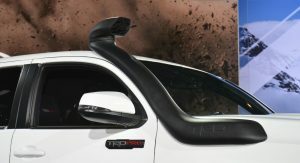 At the front, the Tundra TRD Pro’s front Fox shocks incorporate 11 bypass zones while the rear units have 12 bypass zones. 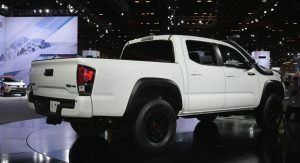 Additionally, both the front and rear ends have had their ride height increased by over 2 inches. 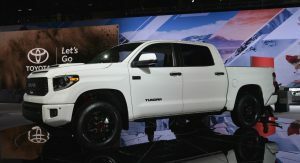 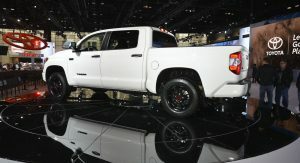 The Tundra also receives 18-inch BBS forged aluminum lightweight wheels wrapped in Michelin P275/65R18 all-terrain tires. 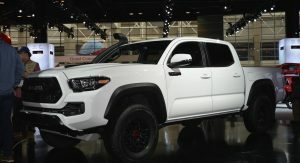 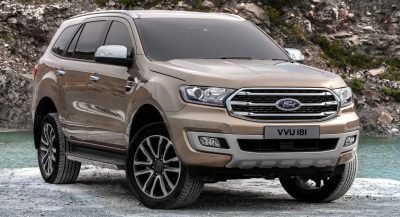 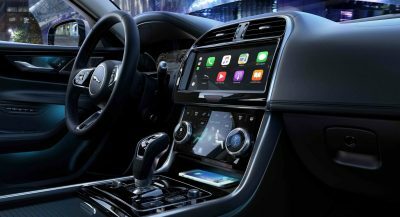 Completing the modifications are black LED headlights, a new grille, custom hood scoop and Rigid Industries LED fog lights. 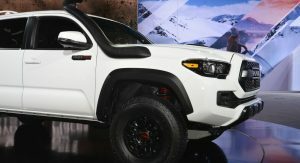 Moving to the Tacoma TRD Pro, its front shocks have 8 bypass zones while the rears utilize 11. 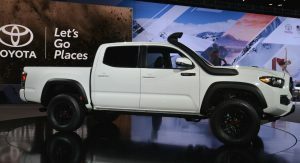 Ride height has been increased by 1 inch and a pair of 16-inch wheels have been fitted, wrapped in P265/70R16 Goodyear Wrangler Kevlar All-Terrain tires. 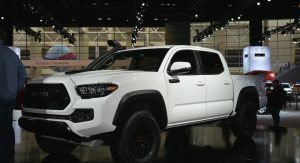 Finally, there’s the 4Runner TRD Pro. 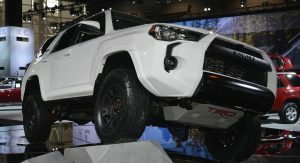 Up front, the Fox shocks include 7 bypass zones while the rear ones have 11. 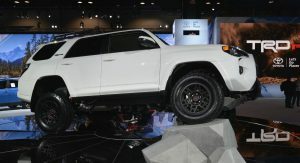 Ride height has also been increased by an inch, while the a set of matte black 17-inch wheels rounds off the upgrades. 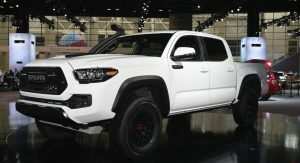 Looks almost identical to the last TRD Pro models to be honest. 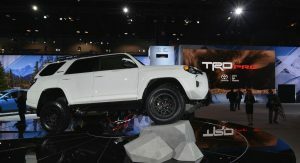 Although, that was to be expected. 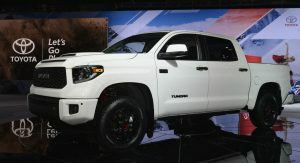 Agree, more like facelifted rather than all new. 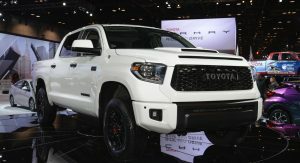 If there is a facelift I can’t tell. 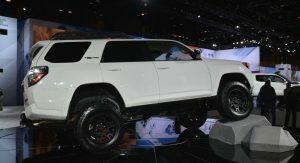 But I’m guessing that was the point; all the work done underneath without it being obvious on the outside. 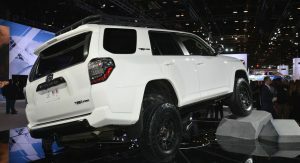 4runner the best looking. 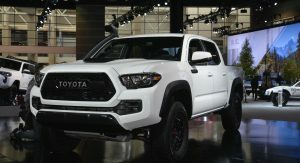 Sadly, it and the tacoma pack underpowered 20 year old V6’s still, in addition to quite old, albeit updated, chassis as well. 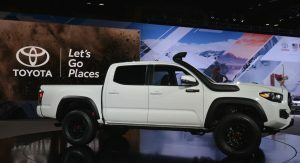 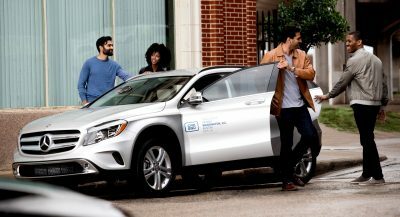 Why is Toyota SO slow to thoroughly update powertrains and chassis for itself and its Lexus brand?